While previously released Lonely Animals in FarmVille have been rather disappointing (as they're normally re-releases of animals many of us already have... in bulk), a new Lonely Animal has appeared on the outskirts of our farms that might actually be worth the effort to lure into our games. 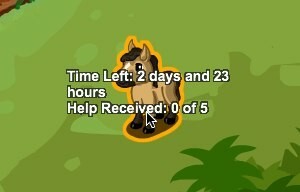 A Buckskin Mini Horse is now available as a Lonely Animal, via the same process that you'd expect: You'll need to ask five friends to help you lure the scared animal into your game, and you'll only have a three day period to get it done. You can also purchase the Buckskin Mini Horse outright with Farm Cash, if you'd rather not wait for your friends to help you. Additionally, if you already have enough Lonely Animals to satisfy your needs or wants, you can ignore this poor pony altogether. Either way, the clock's ticking on how long you have to bring this animal into your game, as you'll have just under three days as of this writing. Make sure to check out this horse and ask your friends to help you sooner, rather than later, before you miss your chance to add a free horse to your collection. Will you ask your friends to help you with this Lonely Animal in FarmVille, or do you already have Buckskin Mini Horses on your farm(s)? Sound off in the comments.